The coming year marks 3 very big milestones in the academic year for us, Kelsey is sitting her A-levels, Hayden will be sitting his GCSE’s under the new format and it’s Thomas’s first year at primary school! Although the teens don’t live with us and so do little homework with us, we still like to support their education and make sure that they have everything they need to feel comfortable with their learning and revision. 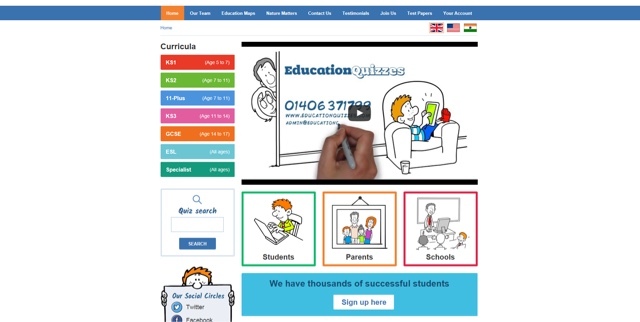 When I heard about Education Quizzes I headed over to the site to have a look at what it offered, lots of fun education quizzes based on the national curriculum from Key Stage 1 through to GCSE’s. A number of the quizzes are available for free and the subscription costs just £7.50 per month, which will provide a plethora of quizzes for your children. Aware of the fact that not all parents can afford the subscription fee, Education Quizzes have just launched a school subscription which can work out to as reasonable as £2.00 per pupil per year, the rate does depend on the number of students at the school but I’m sure that most schools could actually afford this, I shall definitely be mentioning it to Thomas’s school to support their learning. I think that offering quizzes for revision or homework would be a great addition for any school to offer. You can see more information about the School subscription here or share with your children’s schools. I really wish we’d have known about this when Hayden was sitting his 11 plus, I think that is would really have helped with him feeling more confident about taking the exam and I’m sure that around revision time next year he will really benefit from using this resource and taking the quizzes to support the work he is doing at school towards his learning. The KS1 quizzes look perfect for after Thomas has completed his Reception year and I’m sure we will really benefit from using them. Both of the boys are definitely the sort of children who benefit from learning without knowing they are learning and this method is absolutely perfect for that. I love that it’s computer based and that there are focused areas for Students, Parents and Schools. So, why not share this link with your school and see if they will sign-up and help other parents and children during these really important times in your children’s life. Disclaimer: this post has been written in collaboration with Education quizzes. Thats so cool idea. I thought that artificial intelligence aided machine learning will be used only in games. I think it is very useful. Especially medical education. Student can see deeply all human organs and small important things, not only read, learn and write engineering essay like https://pro-papers.com/engineering-writing-service . I'm realy proud of humanity. Development isn't paralysed.